Head deep into the jungles of central America on a quest for lost pyramid treasure in Book of Maya, a simple but potentially explosive 5 reel, 10 payline video slot from Novomatic. The highlight here is the Free Games feature where a randomly chose symbols expands to fill the reel whenever it hits. Play in Extra Bet mode and you’ll get sticky respins during the feature too. Play this volatile game on all devices from between 10p and £20 per spin. Even by Novomatic standards, the design here is pretty basic. The reels are set against a backdrop of jungles and ruined temple. On the reels you’ll see lower value A to 9 playing cards (which are done in stone) plus a selection of Mayan icon statues. The most rewarding symbol is the treasure hunter who will get you a payout of 5, 50 or 250 times your bet if you land 3, 4 or 5 on a payline. Helping to create those winners is the Book of Maya which is the wild. As well as substituting for all other symbols, it also acts as the game’s scatter. Land 3, 4 or 5 of these on the same spin and you’ll pocket 1, 10 or 100 times your bet as well as triggering the Free Games feature. Here you can look forward to 10 free spins. Before the round begins, 1 symbol is chosen at random. When this symbol hits during the free spins, it expands to fill the whole of the reel. Double your stakes in the base game to activate the Extra Bet mode and these stacked symbols can deliver even more extras during the feature. The random symbol expands as normal – it then locks in position and the rest of the reels spin again. If another random expanding symbol hits, the process is repeated. This gives you more opportunities to land hefty cluster of matching symbols and some potentially very big paydays. As you’ve no doubt already gathered, Book of Maya is far from a thing of beauty. The feature round is a simple one but has the potential to be extremely explosive, especially if you play in Extra Bet mode. This is a very volatile game so you can expect some big swings to your bankroll. There will be spells when the jungle will swallow up your money in the blink of an eye. Trigger the feature then get a high value random symbol and the coins can quickly flow. 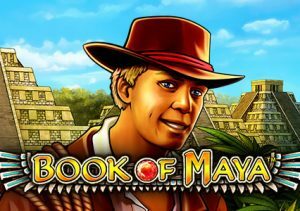 Book of Maya is a classic Novomatic video slot. It’s a bit of a dud as far as design goes but the high variance gameplay makes up for any visual shortcomings. I would also suggest you try the pirate-themed Red Lady which uses the same expanding symbols mechanic in the feature.